This article is about the son of King Edward IV who disappeared from the Tower of London. For the article about his grandfather, the father of King Edward IV and King Richard III, see Richard Plantagenet, 3rd Duke of York. Richard of Shrewsbury, Duke of York KG (born 17 August 1473), was the sixth child and second son of King Edward IV of England and Elizabeth Woodville, born in Shrewsbury. Richard and his older brother, who briefly reigned as King Edward V of England, mysteriously disappeared shortly after Richard III became king in 1483. Prince Richard was created Duke of York in May 1474 and made a Knight of the Garter the following year. From this time on, it became a tradition for the second son of the English sovereign to be Duke of York. He was created Earl of Nottingham on 12 June 1476. On 15 January 1478, in St Stephen's Chapel, Westminster, when he was about 4 years old, he married the 5-year-old Anne de Mowbray, 8th Countess of Norfolk, who had inherited the vast Mowbray estates in 1476. Because York's father's-in-law dukedom had become extinct when Anne could not inherit it, he was created Duke of Norfolk and Earl Warenne on 7 February 1477. When Anne de Mowbray died in November 1481 her estates should have passed to William, Viscount Berkeley and to John, Lord Howard. In January 1483 Parliament passed an act that gave the Mowbray estates to Richard, Duke of York and Norfolk, for his lifetime, and at his death to his heirs, if he had any. The rights of the two co-heirs at law were extinguished; Viscount Berkeley had financial difficulties and King Edward IV paid off those debts. Berkeley then renounced his claims to the Mowbray estate before parliament in 1483. Nothing was done for Lord Howard. Edward V and the Duke of York in the Tower of London by Paul Delaroche. Louvre, Paris. His father died on 9 April 1483. Thus his brother Edward, Prince of Wales, became King of England and was acclaimed as such, and Richard his Heir Presumptive. This was not to last. A priest, now generally believed to have been Robert Stillington, the Bishop of Bath and Wells, testified that Edward IV had agreed to marry Lady Eleanor Talbot in 1461. Lady Eleanor was still alive when Edward married Elizabeth Woodville in 1464. The Regency council under the late King's brother Richard, Duke of Gloucester, concluded that this was a case of bigamy, invalidating the second marriage and the legitimacy of all children of Edward IV by this marriage. Under Gloucester's influence, both Edward and Richard were declared illegitimate and removed from the line of succession on 25 June 1483. The Duke of Gloucester, as the only surviving brother of Edward IV, became King Richard III. The Princes in the Tower by John Everett Millais. Royal Holloway, University of London. The Duke of York was sent to the Tower of London, then a royal residence, by King Richard III in mid-1483, where he was held with his brother. They were sometimes seen in the garden of the Tower, but there are no known sightings of them after the summer of 1483. What happened to the two of them—the Princes in the Tower—after their disappearance remains unknown. Tudor History was quick to blame his uncle, Richard. 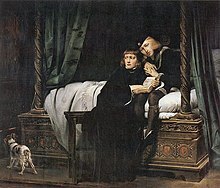 Thomas More wrote that the princes were smothered to death with their pillows, and his account forms the basis of William Shakespeare's play Richard III, in which Tyrrell suborns Forrest and Dighton to murder the princes on Richard's orders. Subsequent re-evaluations of Richard III have questioned his guilt, beginning with William Cornwallis early in the 17th century. In the period before the boys' disappearance, Edward was regularly being visited by a doctor; historian David Baldwin extrapolates that contemporaries may have believed Edward had died either of an illness or as the result of attempts to cure him. In the absence of hard evidence a number of other theories have been put forward, of which the most widely discussed are that they were murdered on the orders of the Duke of Buckingham or by Henry Tudor, Earl of Richmond (later King Henry VII). Bones reportedly belonging to two children were discovered in 1674 by workmen rebuilding a stairway in the Tower. On the orders of King Charles II, these were subsequently placed in Westminster Abbey, in an urn bearing the names of Edward and Richard. The bones were re-examined in 1933 at which time it was discovered the skeletons were incomplete and had been interred with animal bones. It has never been proven that the bones belonged to the princes. 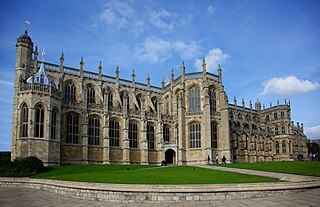 In 1789, workmen carrying out repairs in St George's Chapel, Windsor, rediscovered and accidentally broke into the vault of Edward IV and Elizabeth Woodville. Adjoining this was another vault, which was found to contain the coffins of two children. This tomb was inscribed with the names of two of Edward IV's children: George, Duke of Bedford, who had died at the age of 2; and Mary of York who had died at the age of 14. Both had predeceased the King. However, the remains of these two children were later found elsewhere in the chapel, leaving the occupants of the children's coffins within the tomb unknown. In 1486 Richard of Shrewsbury's eldest sister Elizabeth married Henry VII, thereby uniting the Houses of York and Lancaster. In 1491 in Cork, Perkin Warbeck, a young man of Flemish origin was proclaimed by a variety of Yorkist supporters led by the Irish city's former Mayor John Atwater to be Richard. He claimed to have escaped from the Tower and spent the intervening years on the run. Over the next six years Warbeck travelled across Europe, receiving recognition from a number of monarchs such as Maximilian I, Holy Roman Emperor and James IV of Scotland as "Richard IV" of England. 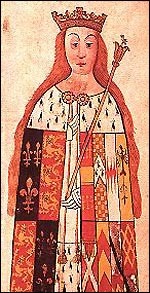 This support included Margaret of York, the aunt of the real Richard. Following his capture after a failed invasion of England in 1497, Warbeck was held in the Tower of London. He confessed to being an impostor, and was later executed following an attempt to escape. As son of the king, Richard was granted use of the arms of the kingdom, differentiated by a label argent, on the first point a canton gules. ^ 1.Chapter Records XXIII to XXVI, The Chapter Library, St. George's Chapel, Windsor (Permission required) 2.William St. John Hope: "Windsor Castle: An Architectural History", pages 418–419. (1913). 3.Vetusta Monumenta, Volume III, page 4 (1789). ^ Linda Porter.Crown of Thistles: The Fatal Inheritance of Mary, Queen of Scots. Pan Macmillan, 2013. Weir, Alison (1995). The Princes in the Tower. Ballantine Books. ISBN 0-345-39178-0. Wikimedia Commons has media related to Richard of Shrewsbury, 1st Duke of York. Born: 17 August 1473 Died: 1483? Edward V succeeded his father, Edward IV, as King of England and Lord of Ireland upon the latter's death on 9 April 1483. He was never crowned, and his brief reign was dominated by the influence of his uncle and Lord Protector, the Duke of Gloucester, who deposed him to reign as Richard III on 26 June 1483; this was confirmed by the Act entitled Titulus Regius, which denounced any further claims through his father's heirs. Perkin Warbeck was a pretender to the English throne. Warbeck claimed to be Richard of Shrewsbury, Duke of York, who was the second son of Edward IV and one of the so-called "Princes in the Tower". Richard, if he was alive, would have been the rightful claimant to the throne, assuming that his elder brother Edward V was dead, and he was legitimate – a contentious point. Anne de Mowbray, 8th Countess of Norfolk, later Duchess of York and Duchess of Norfolk was the child bride of Richard of Shrewsbury, 1st Duke of York, one of the Princes in the Tower. She died at the age of eight. Henry Stafford, 2nd Duke of Buckingham, KG was an English nobleman known as the namesake of Buckingham's rebellion, a failed but significant collection of uprisings in England and parts of Wales against Richard III of England in October 1483. He is also one of the primary suspects in the disappearance of the Princes in the Tower. Thomas Bourchier was a medieval English cardinal, Archbishop of Canterbury, and Lord Chancellor of England. Anthony Woodville, 2nd Earl Rivers, Knight of the Garter, was an English nobleman, courtier, bibliophile and writer. He was the brother of Queen Elizabeth Woodville who married King Edward IV. He was one of the leading members of the Woodville family, which came to prominence during the reign of King Edward IV. After Edward's death he was arrested and then executed by the future Richard III as part of a power-struggle between Richard and the Woodvilles. He wrote one of the first books printed in England. William Hastings, 1st Baron Hastings KG was an English nobleman. A loyal follower of the House of York during the Wars of the Roses, he became a close friend and one of the most important courtiers of King Edward IV, whom he served as Lord Chamberlain. At the time of Edward's death he was one of the most powerful and richest men in England. He was executed following accusations of treason by Edward's brother and ultimate successor, Richard III. The date of his death is disputed; early histories argued for a hasty execution on 13 June, while Clements R. Markham argues that he was executed one week after his arrest on 20 June 1483, and after a trial. The Fortunes of Perkin Warbeck: A Romance is an 1830 historical novel by Mary Shelley about the life of Perkin Warbeck. The book takes a Yorkist point of view and proceeds from the conceit that Perkin Warbeck died in childhood and the supposed impostor was indeed Richard of Shrewsbury. Henry VII of England is repeatedly described as a "fiend" who hates Elizabeth of York, his wife and Richard's sister, and the future Henry VIII, mentioned only twice in the novel, is a vile youth who abuses dogs. Her preface establishes that records of the Tower of London, as well as the histories of Edward Hall, Raphael Holinshed, and Francis Bacon, the letters of Sir John Ramsay to Henry VII that are printed in the Appendix to John Pinkerton's History of Scotland establish this as fact. Each chapter opens with a quotation. The entire book is prefaced with a quotation in French by Georges Chastellain and Jean Molinet.